Lanes of London pays tribute to the great multiculturalism that is the hallmark of the English capital by drawing from its many and varied culinary pockets for inspiration. Head Chef Anshu Anghotra trained at Michelin-starred chef Raymond Blanc’s culinary school at Le Manoir aux Quat’ Saisons and cooks an all day menu designed for sharing with four key sections, each of which have been named after a well known London Lane. There’s ‘Brick Lane’ for some fiery, spicy flavours; ‘Edgware Road’ for some Middle Eastern exoticism; ‘Kingsland Road’ for the fragrant aromas of Asia and ‘Portobello Road’ for a touch of eclectic comfort dining. Its an interesting menu and extends to British classics including fish and chips. 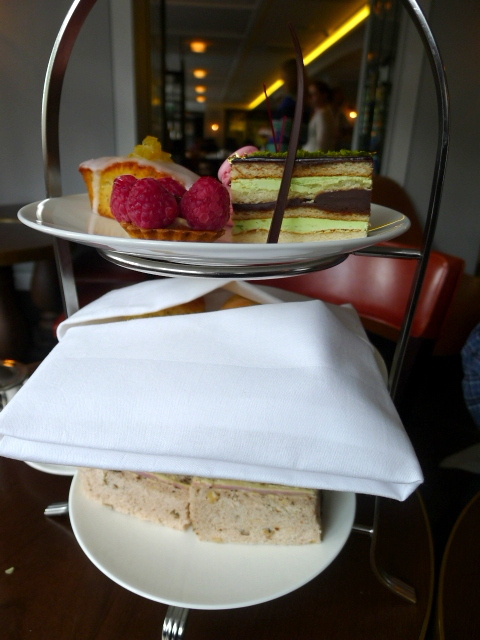 What’s more, there’s also afternoon tea with sandwiches, scones and pastries (£23 or £29 with a glass of champagne). Lanes of London is a really engaging restaurant with a classically smart décor, which is sophisticated yet comfortable. Located in the Marriot Hotel on Park Lane, it’s like a little oasis that makes for a nice reprieve from the hustle and bustle of Oxford Street. 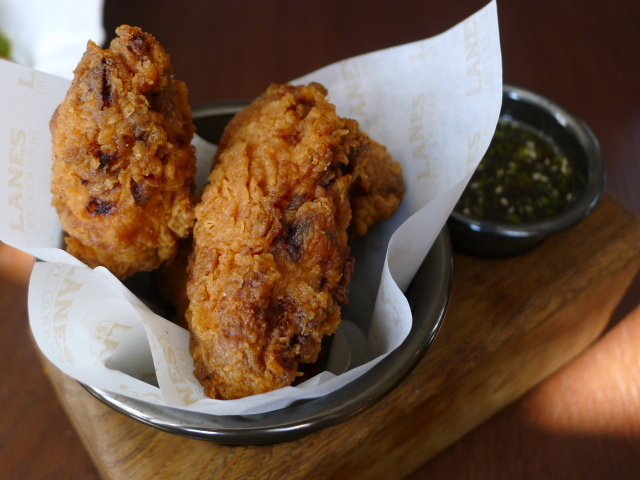 We had gone to Lanes of London for afternoon tea, but tempted by the rather engaging all day menu we decided to try some fried chicken with a honey and sesame sauce (£12) from the Portobello Road section of the menu and the Cornish lamb cutlets (£10.50) first. The batter on the fried chicken was sublime. Crunchy and well made, it held in the moisture of the chicken really well, although a little bit of chilli heat in the batter would also have been welcomed for a bit of a kick. The accompanying sauce worked well with the chicken. 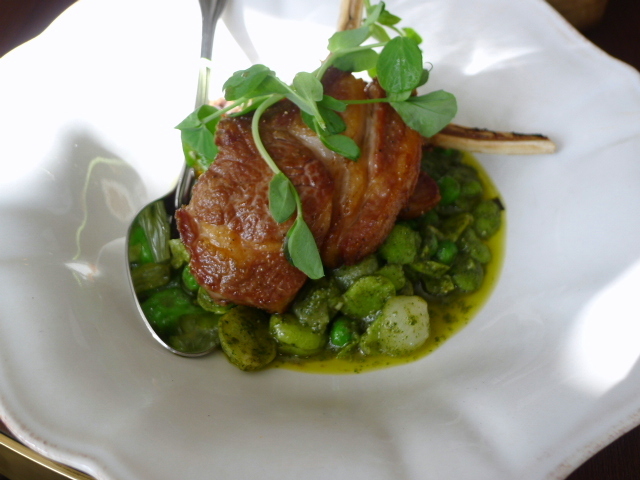 The Cornish lamb cutlets, served on a bed of peas, beans and a mint pesto, were really nicely done. The cutlets were tender and delicious, and the pesto was fragrant. It was a touch under seasoned, but impressively tasty nevertheless. Thumbs up so. We then moved onto our afternoon tea which included a variety of sandwiches such as free range egg mayonnaise and cress; cucumber and mint; honey glazed ham and mustard pickle and smoked salmon with cream cheese. 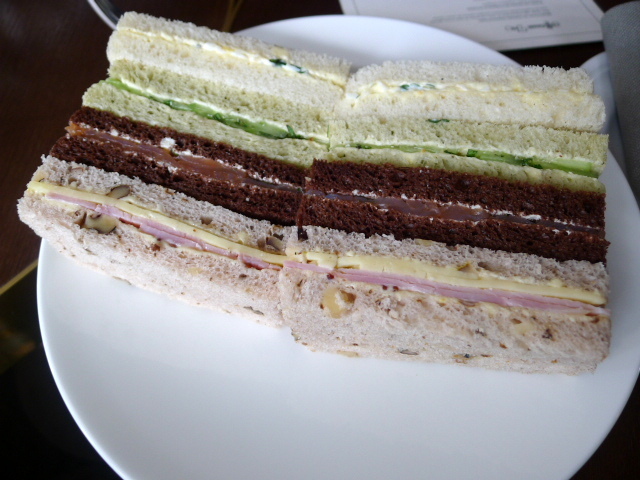 The sandwiches were decent, although we found the walnut bread with the smoked salmon a little overpowering. The plain and raisin buttermilk scones proved to be delightful and addictively moreish. The bake on the scones was great and gave them a fluffy, airy centre. Accompanying the scones were some clotted cream and a delicious but not too sweet strawberry compote. The pastries were accomplished and included a lemon and poppy seed cake which was lovely and moist. A raspberry tart came with a buttery, flaky pastry, and a chocolate and pistachio délice was well made with a deliciously rich chocolate ganache. A strawberry macaroon was light with a gooey centre, although the filling tasted a little odd. We were really impressed with Lanes of London. Not only was the originality of the menu impressive, but it was also fun with a little bit of something for everyone. The savoury dishes that we tried from the all day menu really hit the spot and we found the afternoon tea to be decent value. The waiting staff were cordial and welcoming which rounded off our very pleasant visit to Lanes of London. 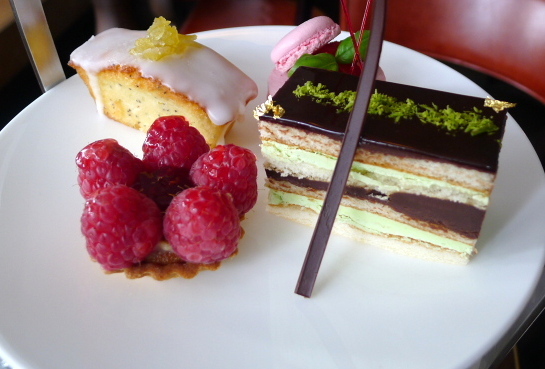 Afternoon tea – £23 or £29 with a glass of champagne. All day menu – about £40 per person, excludes drinks and service.